In the online world of content management systems, several platforms easily stand out above the rest. One great open-source CMS belongs to Drupal, which was first released in January, 2001 by Dries Buytaert. It can be used by everyone from personal bloggers to large corporations. What really really developed a major buzz when whitehouse.gov was redeveloped on the Drupal platform here in DC. Drupal, being the awesome open-sourced platform that it is, is surrounded by a very involved and enthusiastic community of designers and developers in DC, Virginia and Maryland. Anyone who has had experience with the DC Drupal community knows the passion fellow Drupal users share. The Drupal.org website has easy access to a community forum that allows users to ask and answer questions from their Drupal peers. If you are just getting started with Drupal, this is super useful. It allows you to search for answers and posts based on your questions as well as giving you the opportunity to provide posts that can be answered by other people in the community. At its core, a Drupal website is powerful, yet simple. This is ideal for personal bloggers. As the needs of the site become more complex, the user can add modules thereby extending the functionality of their site. If the user feels as though the module they installed does not do what they intended it to do, or if they can’t find the exact module they want, they are encouraged to work towards building their own. Developers who are interested in this, should consult the list of suggested guidelines and ideas. In short, Drupal is everything a modern CMS should be, with the potential to grow as needed. It is simple at its base with an endless resource of modules and extensions that can be used to build a more complex system to fit your web needs. At our DC web development company, our team of developers are seriously dedicated to Drupal and its capabilities. We have a vast understanding of the best and most effective modules, and can help our clients build their ideal Drupal-based site. Our team works one on one with each client to ensure all bases are covered when it comes to addressing the needs of a website. Chat with us or shoot us an email to learn more about how we can best take care of your Drupal needs! 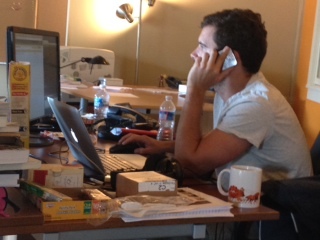 Here’s one of WDG’s development experts, Grant, on the phone with a client offering some assistance on a Drupal site!